Alan Bonnici, Nick Keeling and Puneeth Appachu went on a fishing session scoping new areas around Roxburgh Park. They guys collectively did very well catching many small Redfin on a range of soft plastics and hard body lures. 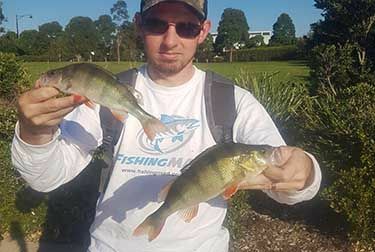 Alan did very well using the Strike Tiger 3 inch curl tail in the Orange Vodka colour and the other guys had success using Zman grubs in a range of colours. No large Redfin on the day with Nick catching the largest Redfin measuring around 28cm.